With the first tablet pcs with Wacom’s new Active ES digitizer now on the market, the task of selecting a penabled device has become significantly more nuanced. 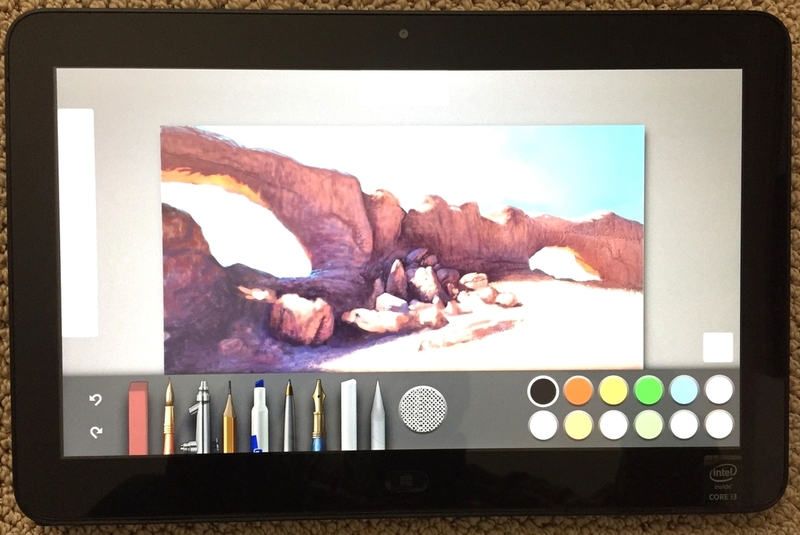 I’ve been using and really enjoying the 10” Toshiba Encore 2 Write for a while now and I still owe readers a review of that AES-equipped product (artist Eric Merced has just published one that I will be reprinting shortly). But in the meantime, I'd like to focus on what may be among the last of a breed: a tablet pc with the Wacom EMR (Electro-Magnetic Resonance) tech we’ve known for over a decade. 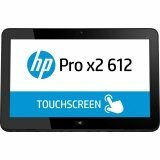 The HP Pro x2 612 G1 may be one of the worst named products ever. It’s also very poorly marketed, seemingly available only as a business product through HP.com or other online retailers. But with a starting price of as low as $695 via one Amazon reseller, the tablet is definitely worth a closer look. I received my unit in early January, and I’m glad that I held off on writing this review so that I can compare it not only to the low-cost Toshiba but also to the Wacom Cintiq Companion 2, which I’ve been testing for a little over a week. I decided to purchase the base model, with an Intel Core i3-4012y 1.5GHz processor, 4GB RAM and a 64GB HD. I paid $762.50 via Staples.com. The tablet has a 12.5" screen and offers a resolution of 1920 x 1080. A Core i5-4302y model with 8GB RAM and 256GB SSD and bundled power keyboard will set you back about $1320. Although I cheaped out and bought the lowest cost model, this higher end configuration is definitely the way to go for most users. 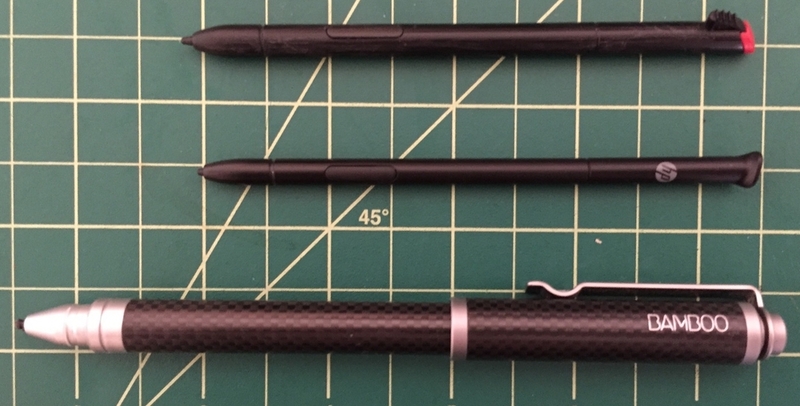 The included pen (above, middle) is a stick stylus even thinner than the one included with the Thinkpad Yoga (above, top). It’s nice that it can be stored away inside a silo for emergencies (see right), but I suspect I’ll never use it. For any prolonged creation or notetaking purposes, you’ll definitely have to buy your own tablet pc compatible pen. I tested a variety of options and found that my old standby the Wacom Bamboo Feel Carbon’s nib had the best grip on the extremely slippery display (more on that in a bit). The low-end configuration doesn’t include a keyboard and I’m unsure whether HP sells one separately. I wasn't able to find it. Invoking the on-screen keyboard is a drag in Windows desktop, so you’ll definitely want to at least pair this tablet with a Bluetooth keyboard. The tablet also doesn't have a built-in kickstand, so if you don't buy it bundled with a keyboard, you'll also need a stand. 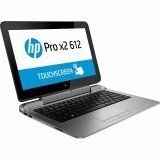 The bottom line is that this HP Pro x2 612 G1 is a very Spartan device. But I also like it a lot and think it compares very favorably to the entry level Surface Pro 3. In fact, an i5 version of the tablet feels like it could be a big brother of the Surface Pro 2 (see below). If you have any qualms about adopting N-Trig, the HP Pro is definitely worth considering. The biggest issues I have with the tablet are aesthetic. The 2.2 lb. device is ½-inch thick, with contoured edges. I generally prefer that to squared-off corners. Unfortunately, the HP’s display isn’t flush with the matte plastic case and the resulting edge feels sharp and uncomfortable (right). The bottom edge of the tablet is flat and where HP has placed all the ports. In addition to two keyboard alignment posts and a docking connector, there’s the pen silo, a micro SIM slot, a micro SD slot, a USB 3.0 port, headphone jack and power connector. I lament not having the bundled keyboard to understand how these ports are accessed once the keyboard is attached. I also can't say what angles the keyboard allows. Unlike most tablets, the HP tablet uses an ungainly laptop power adapter which doesn’t fit snugly and hangs awkwardly during charging (right). The physical Windows button (below) is concave and requires some effort to press. Some may like this because it probably reduces the likelihood of accidental jumps to the Start screen. But since I don’t experience that issue with my other Windows tablets, I don’t care for this cheap-feeling design. On the positive side, I really like some of the choices HP made on the back of the tablet. The matte plastic finish is comfortable to the touch and remains cool even after several hours of running benchmarks. The vents are located at the top of the tablet, away from your lap. And although the fans will blow regularly, the HP Pro x2 612 G1 is very quiet compared to the Surface Pro 3 or Companion 2. There's a large slot for a smart card reader (which I'll never use but I assume works). Below the volume rocker is the power switch, which you have to hold down for a couple of seconds in order to wake the device. Above the volume controls is the rotation key, a handy physical rotation lock that all tablets should have. The 12.5" display with Intel HD Graphics 4200 is bright and sharp and view angles are excellent with next to no color or brightness variation. I assume the display is glass, but it appears to be coated with an additional layer of very slick material. This is the slipperiest display I have ever seen on a Windows tablet. Although my initial impression for drawing on the bare surface was positive, as I tested more for this review, I discovered I couldn't get consistent strokes no matter which tablet pc pen and nib combination I tried. It's hard to tell from the photo above (pardon my crappy lighting conditions in this new office), but it depicts the HP Pro x2 612 G1 sitting on top of the Companion 2. Although the HP's display is only 0.8 inches smaller, the Companion's bezel on bezel case is huge by comparison (pictured right). Despite its design flaws, the HP definitely wins for portability. This HP Pro x2 612 G1 model is no speed demon. It scored 1738 on the PCMark Home Accelerated 3.0 benchmark vs. the i5 Companion 2's 2793. But so far I haven't noticed any appreciable lag while drawing in Clip Studio Paint, Sketchbook Pro, Sketchable and Photoshop. And most significantly, the fans are much less noisy than the Companion's, kicking on much less frequently as well. Clearly, the HP Pro x2 612 G1 is not a dedicated art tablet like the Companion, but if you're on a budget, this entry level model probably comes close enough. Its biggest downside is the 64GB of storage. I actually ran out of disk space while writing this review and installing multiple GBs worth of benchmark software. If you're not bothered by N-Trig, the entry level Surface Pro 3 is a better all-around choice. And for the truly budget conscious, the new Toshiba Encore 2 Write is hard to beat at $400. But if you're looking to reproduce the traditional Wacom experience found in the Surface Pro 1 and 2 with a significantly larger display, the HP Pro x2 612 G1 is the cumbersome product name worth remembering. FOOTNOTE: A reader asked and I felt I should clarify that this review and my assessments of the HP's "value" are relative to the $700 price tag of the entry level tablet. Clearly the i5 version competes very closely price-wise with the higher end Surface Pro 3 and mid-level Companion 2 as well as several other devices like the Lenovo Thinkpad Yoga. They all have their pluses and minuses as well-rounded tablet pcs, but there is no doubt that the Companion is the better choice for a professional artist.